Plot Synopsis: Skeptical graduate students Helen Lyle (VIRGINIA MADSEN) and Bernadette Walsh (KASI LEMMONS) befriend Anne-Marie McCoy (VANESSA WILLIAMS) while researching superstitions in a housing project on Chicago’s Near North Side. From Anne-Marie, as well as through interviews with other college students, Helen learns about the Candyman (TONY TODD), a knife-wielding figure of urban legend that some of her neighbors believe to be responsible for a recent murder. After a mysterious man matching the Candyman’s description begins stalking her, Helen comes to fear that the legend may be all too real. 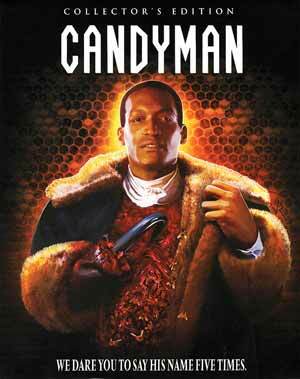 Quick Hit Review: Candyman is one of those movies I’ve certainly heard of but never got around to seeing. This being my first viewing, it is one of the better supernatural-horror films, which says something since I’m generally not a fan of that subset of the horror genre. Tony Todd is wonderful as the titular role and Virginia Madsen certainly shines in the lead role, having a few quite vulnerable scenes. The film was directed by Bernard Rose who has helmed a variety of films ranging from the 1997 adaptation of Anna Karanina as well as a variety of horror films like sxtape (which I have actually seen and own in my collection) and a 2015 version of Frankenstein. 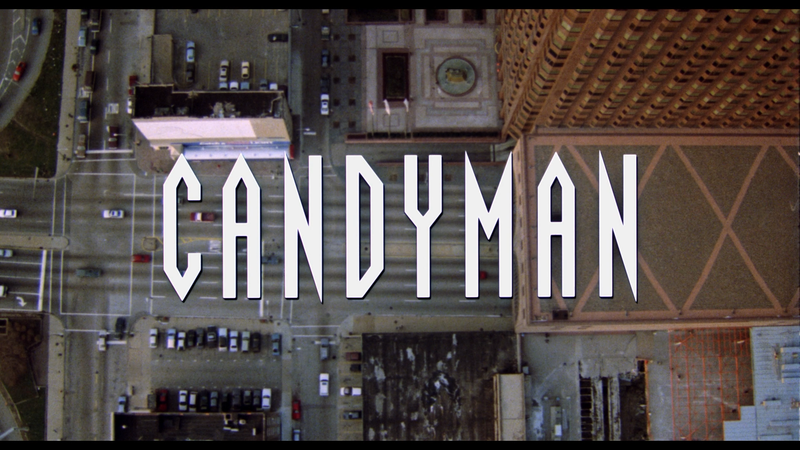 This isn’t a wonderment of filmmaking but effective especially when you consider Candyman himself doesn’t make a full-on appearance until the 45-minute mark. This release comes with a matted slip cover. The interior cover is reversible revealing the film’s original poster artwork. Wow, not often you get one track nowadays, but four? You really get a wide ranging of topics with these tracks. The third track with the ensemble was recorded separately but still rather interesting while the new ones give a different perspective 26 years later. Sweets to the Sweet: The Candyman Mythos (23:49) – This is an older featurette from 2004 featuring interviews with Virginia Madsen, Tony Todd, Clive Barker, and others discussing the idea of urban legends. Clive Barker: Raising Hell (10:46) is an interview from 2004 with the author behind the Candyman short story (as well as Hellraiser). The Heart of Candyman (7:07) is an older interview from 2014 with actor Tony Todd on what drew him to the character. Bernard Rose’s Storyboards (5:22) shows off some of the storyboard artwork. The remainder of the disc contains the Theatrical Trailer (2:05), a few TV Spots (1:36), a Still Gallery (5:19) and the Original Script accessible via the BD-Rom. These are an awesome selection of the interviews, each one talking about their careers and reflecting on their work on Candyman. Highlights for me were the ones with Madsen, the FX team and, oddly, Guy. A note on the Unrated Cut, since I watched the Theatrical Cut, I can’t tell you what was different, but the running times were exactly the same. I did check out a few scenes and one, with Helen meeting her psychologist seemed a bit more brutal and the transfer did not match the other scenes (as it says on the back, the Unrated scenes were HD inserts from a rare print). Candyman arrives on Blu-ray through Shout Factory, presented in its original 1.85 widescreen aspect ratio and a 1080p transfer cultivated from a new 4K scan of the original negative and was supervised and approved by Bernard Rose and his DP, Anthony B. Richmond. I was greatly impressed with the picture, detail was sharp and natural film grain and noise was left intact. Colors are generally bright while black levels were stark but never appeared crushed. Should be noted, the “Unrated Cut” has those scenes taken from a rare print and in the one scene, with the psychiatrist, there were evident dust or dirt marks and the shot does look out of place compared with the rest of the cleaned up film. The film has been given a strong DTS-HD Master Audio 5.1 track (and 2.0 as custom for Shout releases). This does sound quite good with clear dialogue levels and some nice depth, especially noticeable once Candyman does make his appearance. The music/score from the superb composer Philip Glass made its way through the rear channels alongside some minor ambient audio. Overall, Candyman might not be some horror classic in my book, but it was incredible enjoyable with a few good twists with taking it down an unexpected path, at least compared to others in the supernatural-horror subgenre; but what was especially noteworthy were the performances from Virginia Madsen and Tony Todd. This “Collector’s Edition” Blu-ray from Shout Factory has great video/audio transfers to go along with a fantastic set of bonus features.